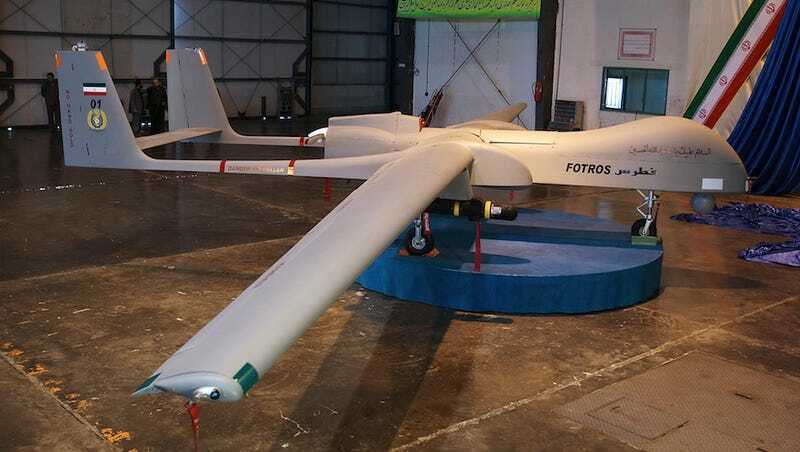 Iran welcomed a new addition to its drone fleet on Monday with the unveiling of the Fotros. Iranian Defense Minister Brigadier General Hossein Dehqan says this familiar-looking can do anything from taking pictures of Israel to protecting Iran's borders. So he says. Dehqan told the crowd at the unveiling ceremony in Tehran that the Fotros boasts a range of 1,250 miles and can stay aloft for up to 30 hours and fly as high as 25,000 feet. Those specs are similar to those of the U.S. Air Force's Predator and Reaper drones and slightly less impressive if you consider the fact that the Predator's nearly 20 years old and the Reaper's nearly 15. It's worth mentioning that the Fotros does look pretty similar to those U.S. drones, a suspicious detail especially since Iran's been accused of copying seized American drones in the past. It's almost impossible to hear about this new war machine and not furrow your brow a bit. Less than a month ago, Iran released video of a "drone-like guided missile" that appeared to be held together with packing tape, a clear indication that the country still has a ways to go in terms of technological sophistication. And few people can forget the Hamaseh Stealth and Combat Drone unveiled earlier this year which very obviously did not have stealth capabilities. But hey, at least they didn't Photoshop this thing together—at least, not that we know of.